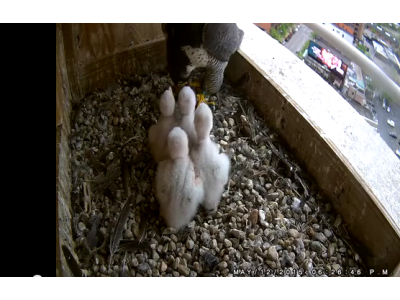 All four eggs have successfully hatched and the chicks (eyases) are keeping Mom and Dad busy. The first 2 eggs hatched on May 4, the third egg hatched on May 5, and the last egg hatched on May 7. Rebecca has the biggest role in feeding and brooding the chicks. Kewpee steps in to stand guard when she leaves. He tries to brood the chicks, but he is smaller than Rebecca (typical for falcons, males are smaller than females) so he has a hard time covering the chicks, especially as they get bigger. But, he checks them over closely and is always close by. The smallest one has had a hard time competing for food with his/her larger siblings, but when they are full, stop begging, and topple over to snooze, he gets a meal. Dad even shared a snack with him yesterday, which is the first we have seen Kewpee feeding the chicks. He got the hang of it, more or less - you can see the video clip in the archive. "Tiny" is pretty feisty little one and has been sqirming his way to the front of the pack and getting food ahead of his bigger siblings. The adults apparently have a pantry close by where they have been storing food and leftovers since they are pretty fast with the room service when the chicks are ready to eat.